The best way to make the best of any full book schedule, is to squeeze in some fun with friends. On Tuesday, I was to speak at the JCC in Manhattan about my book and also the history of Jews in Iran. I really enjoyed meeting so many interesting people at the talk and a very interesting dialogue ensued after my talk. What is always so special to me is to see people who have read my book show to one of these talks. It is a way of connecting with my readers and to putting a face with the names of people who write to me on my web site. I was lucky to meet a few of such people at the JCC event. Right after the evening tlk, I met with my good friends Sherly and Abbey and we went off the Pastis at the meat packing district. At 10 pm on a Tuesday night, the place was packed and there were lots of people walking in the streets. We caught up with one another over drinks and dinner and helped ourselves to 3 deserts! If you guys don’t know, I would rather skip a meal and go straight to desert, which I am forcing myself to do less often! Well this brings me to another extraordinary desert place that I ran into the next day–LADY M Confections. 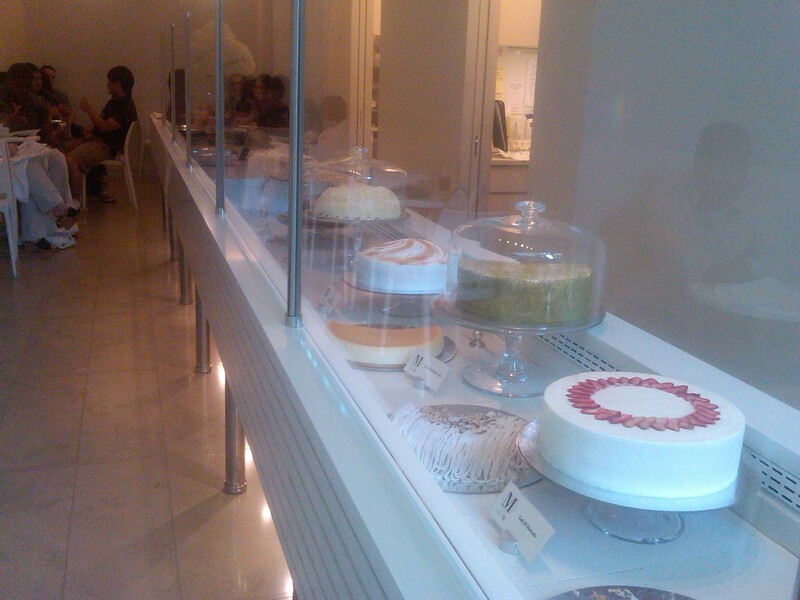 Seriously, it is a jewel of a pastry shop tucked in 43-42 10th Street. The Eclair was divine. Once I started talking to the owner and chef, Ken Romaniszyn, I had to try their mille crepe cake–one of their signature cakes. It was delicate layers and layers (I don’t know, perhaps 20) of crepe and cream heaven. It was worth skipping a meal for! If this place was in LA, I would be in serious trouble. I still wanted to try their green tea mouse cake and Ken’s other creations. But hopefully next time! Well I still hope he opens a shop here in Los Angeles.